I’m not happy with this. 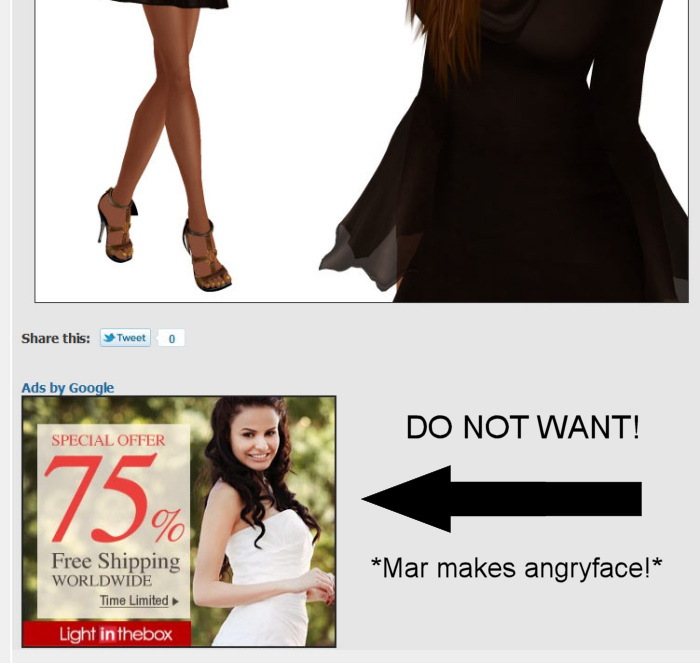 I do not want my readers bombarded with ads when they come to my blog. I understand that this is a WordPress.com thing; that they do it to generate some revenue in return for their free blog hosting. I have no control over this. I can’t even specify what kind of ads are shown (although if I had a choice then NO ads would be shown). Excuse me if I’m textually gnashing my teeth here, but I’ve spent a short while today, hovering around the three Shoe Fly Shoes lucky chairs at Sarah Nerd’s Freebie Paradise. For those not in the know, Shoe Fly Shoes are offering a fabulous pair of superb designer quality monogrammed red leather shoes in these chairs. The letters don’t change all that regularly (around every 30 minutes or so) so while I was there, I kept scanning my radar to see if anyone with the current letters was in range. Four times, people were. And so I sent four IMs: one to each person. The IM consisted of something that could be understood hopefully by most languages: Shoe Fly Shoes Lucky Chair at Sarah Nerds = ‘T’ (or whichever letter the person’s name began with) followed by the SLurl of my exact location in front of the chairs. The first person I sent the IM to didn’t reply, even though I could see her eyeline moving (I had ‘show look at’ enabled), so I knew she wasn’t AFK. The second – who was standing about 10m away from me teleported out a minute later, was still online when I checked her profile, but didn’t bother to reply, not even to say ‘thanks but no thanks’. The third, again standing close by, said, ‘OK’ and didn’t move, then teleported out (to be fair, I don’t think English was her first language). The fourth, however, walked over to the chairs, sat down and received her prize, then got up and walked away again without so much as a ‘thank you’. This was not a newbie avatar; she was created in 2007. She had English as a language spoken in her profile. I had cammed across the entire store to find her so I could send the IM. People, if someone helps you to win an awesome lucky chair prize, a simple ‘thank you’ costs nothing.